We recently had an opportunity to interview Dennis Higgs, (Amex/TSX: URZ) Uranerz Energy's Executive Chairman. Mr. Higgs has been involved in the financial and venture capital markets for over 25-years, and has founded, financed, initial public listed and built several companies - including Arizona Star Resource Corp. that we followed in the late 1990's. Q: Mr. Higgs, thank you for joining us. Please tell us how you became involved with Uranerz Energy? Higgs: Several years ago I founded a company called Miranda Gold. Ken Cunningham had joined Miranda as its president in 2003. By 2004 the uranium market was looking interesting, so I decided to research the uranium sector in more detail. It turned out that Ken Cunningham had managed the gold division of the original Uranerz group of companies, which were controlled from Germany (the "Uranerz Group"). The Uranerz Group had become the world's third largest producer of uranium, but it was sold in 1998 to Cameco. In early 2005, Mr. Cunningham introduced me to Dr. Gerhard Kirchner, who had been the senior vice president of the Uranerz Group. Dr. Kirchner then introduced me to Mr. Glenn Catchpole. Mr. Catchpole decided that he wanted to help build a uranium production company, so on March 1, 2005 he became president of our "new" Uranerz Energy Corporation. That is how we started, with Dr. Kirchner, Mr. Catchpole, and me as founding directors. Q: What production experience does your management team have? - Glenn Catchpole, President & CEO (P.Eng., M.S.) has 34+ years in the in situ recovery ("ISR") uranium sector; 24 of those years in Wyoming. Before joining Uranerz Energy, Mr. Catchpole had been with Cameco. He had negotiated the acquisition of the Inkai project (originally when he was with the Uranerz Group, and then with Cameco after Cameco took over the Uranerz Group) and then proceeded to develop it. He took the Inkai through pilot production, and the Inkai ISR uranium mine is on its way to becoming the largest ISR uranium mine in the world. - George Hartman, Executive VP & COO (M.S. Colorado School of Mines) has 34+ years in ISR mining; 17 of those years in Wyoming. Mr. Hartman is recognized as an ISR mining expert and has four patents issued in his name specific to the ISR mining process. - Kurtis Brown, Senior VP Exploration (B.A. Geology, P.Geo) has 16+ years of Wyoming ISR experience. - Billy Geis recently joined Uranerz Energy. He is a field hand and a good manager of people, working well; he's managing construction of well fields, and overseeing header houses and piping, etc. Q: Why are you focused on Wyoming and the United States? Higgs: The United States has the largest nuclear fleet of any country in the world. This fleet consumes approximately 50 to 55 million pounds of uranium per year. The current uranium production in the U.S. is approximately 4 million pounds per year (approximately 8% of the current amount consumed). Therefore, there is a ready market within the U.S. to sell our product. Wyoming has had continuous uranium production since 1957, and has the largest uranium resources of any U.S. state. Furthermore, we consider the U.S. to have low political risk. So low political risks, established resources and production, nearby markets, good infrastructure, and uranium deposits amenable to the low-cost ISR mining are all compelling reasons to be operating where we are. Q: Why are you focused on the Powder River Basin? Higgs: The Powder River Basin has demonstrated that it has high quality uranium deposits amenable to ISR mining; it has the highest grade ISR - amenable deposits in Wyoming. That is why Cameco and Uranium One are there (two of the largest ISR uranium miners in the world). In fact, all the uranium production from Wyoming since 1987 has been from the Powder River Basin. Most of our people are also from Wyoming and have spent much of their careers working on various projects in this region. This area is their backyard, and they know the projects and the people to be successful. The ISR mining process uses a 'leaching' agent, which contains an oxidant such as oxygen with sodium bicarbonate (commonly known as baking soda) and carbon dioxide, added to the native groundwater and injected through wells into the ore body in a sandstone aquifer to dissolve minerals containing uranium. This solution is then pumped via other wells to the surface for processing into finished yellowcake product ready for sale to utilities requiring nuclear fuel for operations - resulting in a cost-efficient and, relative to other common mining methods, a more environmentally friendly mining process. The ISR mining process differs dramatically from conventional mining techniques in that ISR mining leaves the rock matrix in place. The ISR technique avoids the movement and milling of rock and ore as well as mill tailing waste associated with more traditional mining methods. Q: What is the size and exploration potential of the company's PRB property portfolio? Higgs: Uranerz has Total Powder River Basin Acreage of 91,710 acres, which is 37,114 Hectares or 143 Square Miles of mineral properties with good potential for additional discoveries. We have identified approximately 300 miles of reduction-oxidation boundaries that occur within our project areas, and most uranium deposits in this part of Wyoming occur on these redox boundaries. Thus far we have drilled about 20% of the known trend lines, so there is good potential to increase our resource base organically. Last year we also purchased a drill log database of over 15,000 holes which covers a large portion of our property area as well as the surrounding areas. With this database we have been able to identify drill targets and we could potentially use the data to make acquisitions in the region. We have had two drill rigs exploring, and now that we have the state and NRC licenses we have a number of rigs working on well field installation (monitor wells initially). Q: What are the company's current NI 43-101 uranium resources, for the first 7 of your 30+ PRB projects explored so far? Higgs: Uranerz has reported resources of 19 million pounds in the measured, indicated and inferred categories to date, on seven of its projects. The Company has over thirty projects in the Powder River Basin, so lots of room for additional resources in this region. Q: What is the focus of this year's drill program? Higgs: Uranerz Energy has conducted an exploration drilling program every year with the objective to outline new resources. We have also conducted resource delineation work to qualify additional resources under the National Instrument 43-101 guidelines. Now we are mainly focused on well-field drilling so that we can get into production in 2012. Q: Are you looking to acquire any other projects or companies? Higgs: Yes - we are interested in building our portfolio in the Powder River Basin, but we are also looking in other areas, including parts of western US and abroad and for now we will keep our focus on projects amenable to ISR uranium mining. Q: The Company has made key licensing achievements this year in advancing its Nichols Ranch Project. How long/difficult/expensive is the state and federal permitting process and what advantages may Uranerz now have over some of its competitors? Higgs: The entire permitting process, including the collection of one year of background data, took over four and half years, but as of July this year, we are now fully permitted to construct our first ISR uranium mine. I believe that we are the first Company to commence construction of a new ISR uranium mine in the Powder River Basin in over a decade. Now that we have the state permits and the NRC license, additional satellites could be added as an amendment to the existing license. We believe that this should allow for a much shorter time for licensing additional projects in the Powder River basin. Q: On July 20th Uranerz Energy received its final NRC Materials License to commence construction of the Nichols Ranch ISR uranium mine. Has construction started? Higgs: Yes; the day after we were issued the final license we were out staking locations for positioning the central processing plant. Construction activities will consist of two main functions: building the central processing plant, including office, laboratory, and maintenance buildings; and installing the first well-fields. Site preparation for the central processing plant commenced in late July. The locations for 75 environmental monitor wells were staked and installing these wells has begun. The Company is in the process of improving the roads leading into the site and material purchases are underway. Q: What are the projected capital costs to get production started and ramped up? Higgs: The capital costs are estimated to be approximately $35 million, which includes the central processing plants (currently being built at Nichols Ranch) and the first well-field at each of Hank and Nichols Ranch. Q: How much cash does the Company currently have? Higgs: As of June 30, 2011 (the end of our last quarterly report) we had over $44.8 million. We have been developing our Nichols Ranch project over the past few weeks, but we have a very strong treasury. Q: Does that mean you are fully funded for production? Higgs: With capital costs estimated to be $35 million and with almost $45 million in our treasury at the last quarter-end, I think that we have a strong treasury. Uranerz should have sufficient funds for completing the Nichols Ranch ISR Uranium Project and commencing production. However we may consider bolstering our treasury for property acquisitions, expanded exploration programs or other corporate initiatives. Higgs: Construction is expected to take between 12 to 15 months. We should be in production in the second half of next year. Q: How much will you be able to produce at Nichols Ranch and Hank? Higgs: 600,000 to 800,000 pounds of uranium per year is the initial targeted production level from the Nichols Ranch and Hank projects. Our plan is to expand this production level by bringing other satellites into the production mix. A third project is in the license application preparation stage. In March 2010, we commenced preparation of the environmental permit and license applications for the Jane Dough unit, which is adjacent to the area currently being developed at the Nichols Ranch unit and will share its infrastructure. Jane Dough includes the Doughstick, South Doughstick and North Jane properties. Additional units may be added as we assess our geological data. The mine plan for the Nichols Ranch ISR Uranium Project includes a central processing facility at our Nichols Ranch unit and a satellite ion exchange uranium concentrating facility at our Hank unit. The central processing facility is licensed for a capacity of two million pounds per year of uranium and it is intended that it will process uranium-bearing well field solutions from Nichols Ranch, as well as uranium-loaded resin transported from the Hank satellite facility, plus uranium-loaded resin from any additional satellite deposits that may be developed on our other Powder River Basin properties. The Jane Dough unit is compatible with this plan. We believe this centralized design enhances the economics of our potential additional satellite projects by maximizing production capacity while minimizing further capital expenditures on processing facilities. 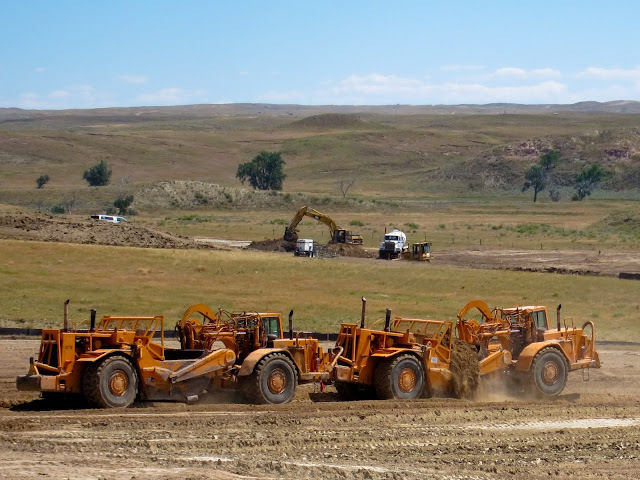 Q: What is the expected mine life of your Powder River Basin projects? Higgs: Thus far we believe Uranerz has over 10 years of production life but with continued success with the exploration programs and possible acquisitions, this could be increased significantly. Q: What are the estimated operating costs on a per pound basis? Higgs: The estimated direct operating costs/pound are about $24 per pound, and $35 per pound with taxes and royalties included. Q: Do you have any off-take agreements for your production? Higgs: Yes. In anticipation of receiving all the approvals necessary to begin production, we commenced a marketing program for conditional sales of uranium from our Nichols Ranch ISR Uranium Project. In July of 2009 we announced that we entered into a sales agreement with Exelon Generation Company, LLC for the sale of uranium over a five year period for defined pricing. In August of 2009 we announced our second contract for the sale of uranium to a U.S. utility also over five years, with a pricing structure that contains references to both spot and long-term prices and includes a floor and ceiling price. These long-term contracts for the sale of uranium are with two of the largest nuclear utilities in the U.S. Both contracts would be considered favourable in the current uranium market sector. Q: How much of an impact do you think Fukushima had on the long-term outlook for nuclear energy and uranium price? Higgs: I believe that the Fukushima incident will not have a dramatic effect on the long term outlook on the uranium price. The reaction by some of the European countries such as Germany, Italy and Switzerland has had a negative impact in the near term. However, those countries are not the leaders in the new building of nuclear plants. The new nuclear plant construction is in Asia; China, India and Russia. I believe that Exelon has as many nuclear reactors operating as there are in all of Germany. By the time the German nuclear facilities are shut down (if indeed they are), the effect on the uranium market at that time is expected to be less than 5%. Q: Who are your largest shareholders? Q: How many shares do insiders control? Higgs: Directors, officers and insiders control approximately 8.5%. Q: URZ has been a Featured Stock since last December. The stock doubled initially to $5.93 a month before the Fukushima accident. From mid-June to mid-July URZ trended higher again as it was added to the Russell Indexes and after announcing the NRC license. From that point URZ is now down about 35%, with most indexes down only 11-17%. Any insights why URZ is underperforming at a time when everything seems in its favour? Higgs: The uranium equities have been consistently battered since the earthquake in Japan. Uranerz has fared better than most, perhaps because of its strong treasury. I have recently seen some of the analysts remarking that the market may have reached a maximum point of pessimism and that opportunities are to be had in the market today. I am not an investment advisor, so I will leave that up to the experts!